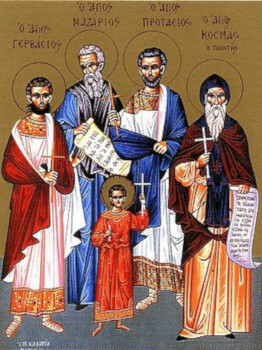 The Holy Martyrs Nazarius, Celsus, Gervase, and Protase suffered during the reign of the emperor Nero (54-68). Saint Nazarius (son of the Christian Perpetua and the Jew Africanus) was born at Rome and was baptised by Bishop Linus. From his youthful years Nazarius decided to devote his life to preaching the teachings of Christ and to aid wandering Christians. With this intent he left Rome and arrived in Mediolanum (Milan). While visiting Christians at the Mediolanum prison, Nazarius made the acquaintance of the twins Protase and Gervase. The twin brothers had been born in the city of Mediolanum into a family of rich Roman citizens – Vitalius and Valeria. But having been left orphans (their parents had been martyred for the Christian faith), the brothers distributed their substance to the poor, emancipated their slaves, and occupied themselves with fasting and prayer. The pagans locked them up in prison for their confession of faith in Christ. Saint Nazarius esteemed the twins, and as much as he was able he relieved their sufferings. But for this the pagans gave him a beating and banished him from Mediolanum. Saint Nazarius proceeded on to Gaul (modern France), and there he successfully preached Christianity and converted many pagans. In the city of Kimel he baptised the son of a certain Christian by name Celsus, and in teaching him, acquired a faithful student and co-worker in their missionary labours. For their confession of faith in Christ, the pagans gave them over for devouring by wild beasts, but the beasts would not touch the saints. Afterwards they tried to drown the martyrs in the sea, but they went through the water, as though on dry land. The soldiers carrying out the orders were so amazed that they themselves accepted Christianity and released the holy martyrs. Set free, Nazarius and Celsus went to Mediolanum and visited Gervase and Protase in prison. For this, they were delivered over to Nero, who ordered that Saints Nazarius and Celsus be beheaded. Soon after this they executed also the holy brothers Gervase and Protase. Many years later, during the reign of the holy Emperor Theodosius (408-450), Saint Ambrose, Bishop of Milan, through a revelation from above discovered the relics of the holy martyrs. The holy relics, glorified by many an healing, were solemnly transferred to the Mediolanum cathedral.